Cave explorers generally fall into one or other of two categories; technical divers who dive in flooded caves but rarely leave the water, and cavers who dive but treat the flooded section as a barrier to finding further dry cave. Rick Stanton is a rarity in that he is at the top of both disciplines. Time and again he has exhibited a knack for pushing beyond the limits where others believed the cave to have ended. Rick, a fire fighter from Coventry England, has been at the forefront of British cave diving for over twenty years. Initially a dry caver he learnt to dive whilst at university in 1979, with the primary intention of exploring caves and sumps in the British Isles. This has been an ongoing process right up to the present day. In 1998 - 89 Rick was involved in Bill Stone's Wakulla II project using the MK 5 Cis Lunar single, then double rebreather for some of the longest dives of that project. 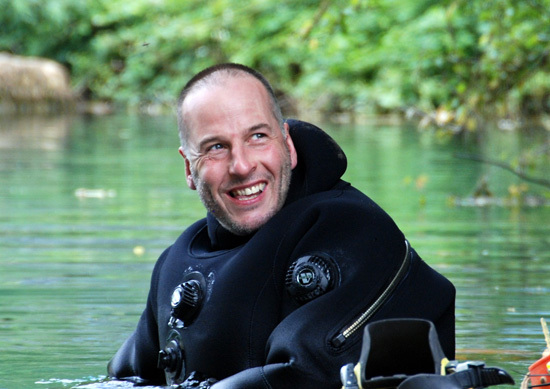 Since then Rick has been involved in more technical cave diving using rebreathers, (often two modular units) for long penetration and depth. He has concentrated on the long deep siphons of northern Europe, mainly in the Lot region of SW France, but also in the other French, Spanish and Italian caves. Rick specialises in combining caving techniques with long and often deep multiple sump systems, transporting large amounts of diving equipment through the dry sections of the cave in the pursuit of exploration.